Sometimes a traditional hang tab just won’t work for your product’s packaging. Maybe it’s an odd shape, has special plastic requirements, or needs unique coloring – whatever it may be, we’ve got you covered with our printed and custom hang tabs. 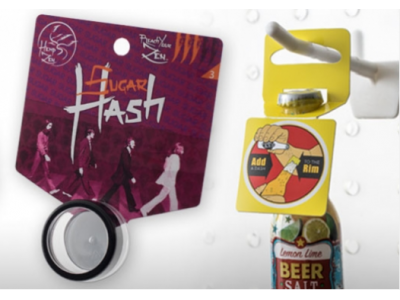 We work with you to find the perfect custom hang tab that will meet all of your unique product packaging and retail display requirements. In this post we will look at the ways that Do-It Corporation works with you to precisely design, print, manufacture, and cut the perfect hang tab for your retail display needs. At Do-It Corporation, our printed and custom hang tabs are designed to work perfectly with products that require a specialized retail display solution. Whether the packaging is oddly shaped or would benefit from a hang tab that contains your product’s logo and exact coloring – we can design and manufacture exactly what you’re looking for. If you’re in need of custom or printed hang tabs, contact us today for a free packaging analysis.